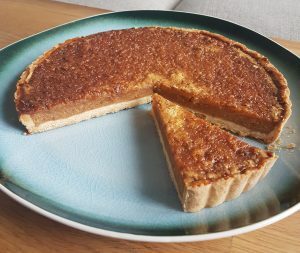 I happened across this gluten free salted caramel treacle tart combination by happy accident, while thinking of ways to use my salted caramel sauce in desserts. 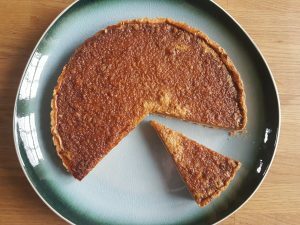 Treacle tart is a dessert classic, but this modern twist turns it into a brilliant gluten free dinner party dessert for those cold winter months. Or, of course, you can just bake one in advance and then microwave for a delicious midweke gluten free treat for your family. 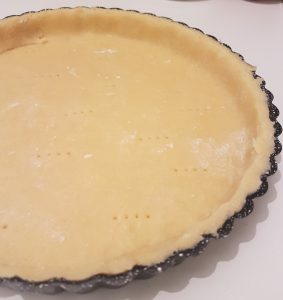 I used an Oast to Host gluten free pastry mix for my tart, but you could use any sweet shortcrust recipe or premade case (if you can find a gluten free one). 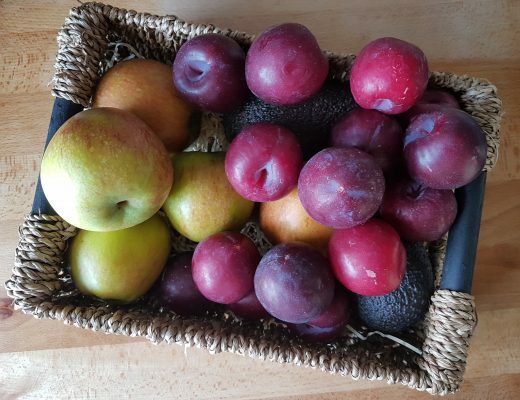 Naomi Devlin has a brilliant gluten free shortcrust pastry recipe in her book (or if you Google it it will pop up online), which is my usual go-to. First up, make the base salted caramel sauce. 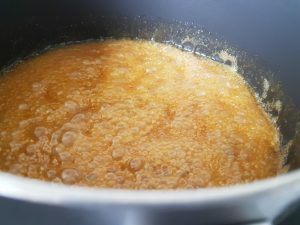 Melt the butter, light brown sugar, caster sugar and golden syrup together in a small non-stick pan over a low heat. Cook very gently for 10 minutes or until it is starting to bubble and simmer slightly. 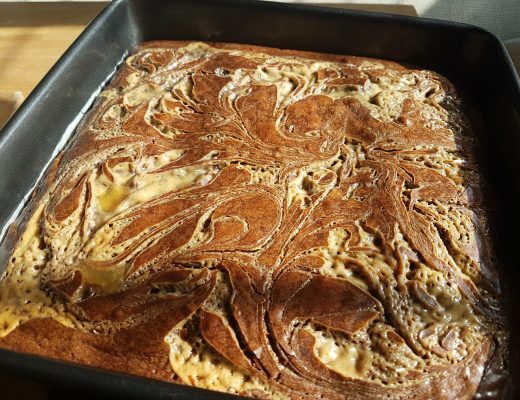 Swirl the pan to mix the ingredients. Add the cream and the salt to the pan, swirling to ensure fully mixed and then cook for another minute on a low heat to warm the cream. Then remove from the heat and pour into a large bowl. Set aside to allow to cool slightly while you bake the pastry. Roll out the chilled shortcrust pastry and lay into a greased, lined loose-bottom tart tin. Prick the base of the pastry and line with greaseproof paper and baking beans. Now blind bake the tart for 10 minutes at 200C. Remove the greaseproof paper and baking beans from the pastry case and turn the oven down to 180C. Beat one egg yolk in a bowl and lightly egg wash the pastry with a pastry brush. Return the pastry case to the oven and bake for 20 minutes at 180C, until the pastry is cooked through and starting to shrink away from the edges of the tin. Remove the gluten free pastry from the oven and set aside for a moment while you finish the filing. Turn the oven down to 160C. 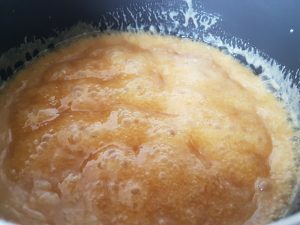 Take the bowl containing the salted caramel sauce and add the 100ml golden syrup, the egg plus extra egg yolk and 150g gluten free bread crumbs. Stir until all the ingredients are well-combined, then pour into the pastry case. Now bake the filled tart in the oven for 30 minutes at 160C, then a further 30 minutes at 140C until the tart is just set with a slight wobble in the middle. Allow the tart to cool slightly and firm up before serving. 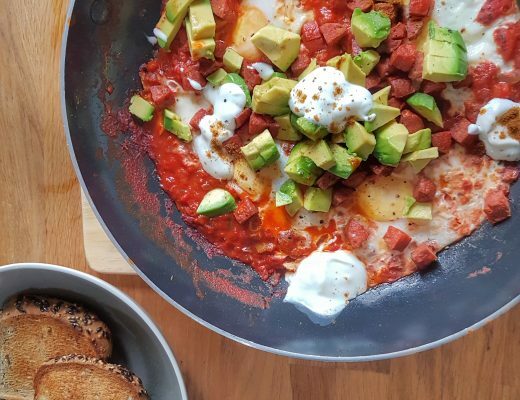 This can be eaten warm or cold and is also easy to microwave or rewarm in the oven if you prefer to make it advance. 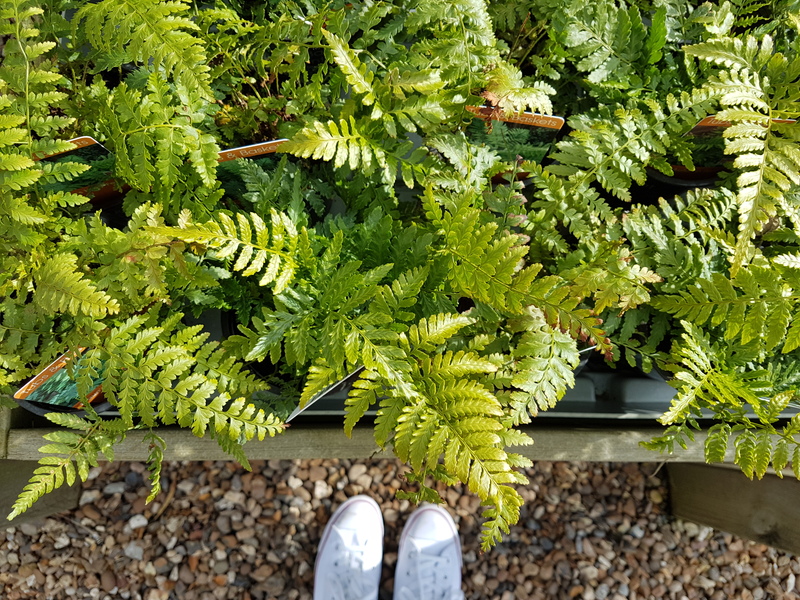 Serve the gluten free salted caramel treacle tart with your favourite topping – clotted cream, ice-cream and custard all work well. Am extra drizzle of salted caramel sauce won’t go amiss either :).